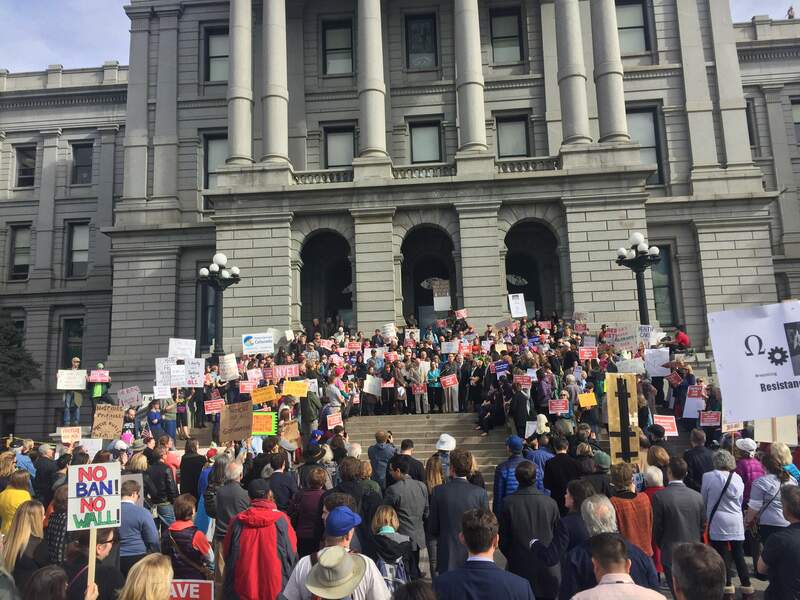 Several hundred Coloradans gathered Tuesday at the state Capitol for a rally held by Democrats to support the Affordable Care Act and the Colorado health care exchange. Amanda Miller, left, relayed a story of how the Affordable Care Act helped her afford emergency medical care for her husband, Matt Miller, right, after a car crash. 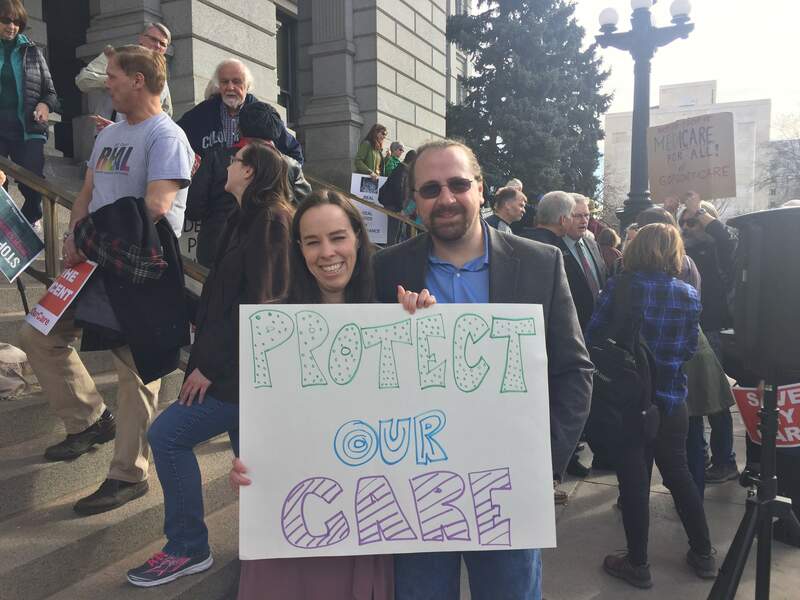 Several Colorado lawmakers attended Tuesday’s rally to support the Affordable Care Act and Connect for Health Colorado, the Colorado health care exchange, and delivered speeches to the hundreds of gathered Coloradans. 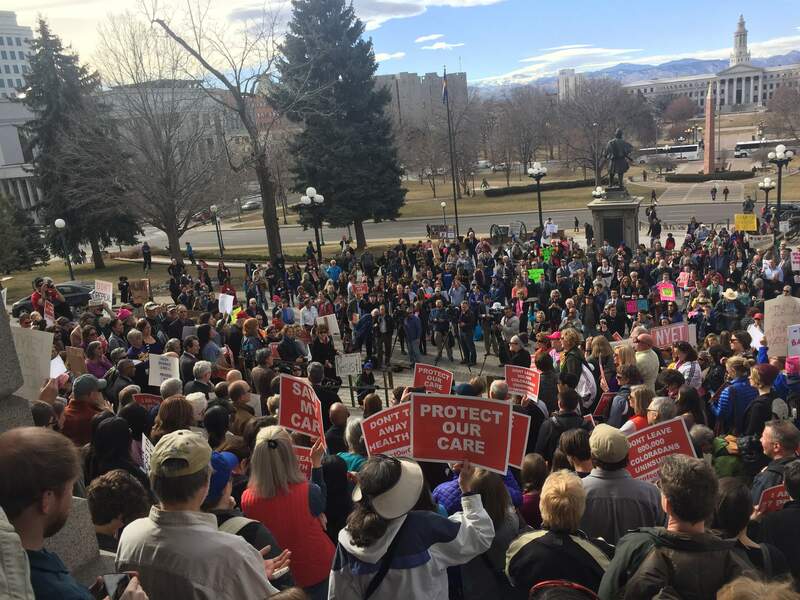 DENVER – Congressional efforts to repeal the Affordable Care Act and a move to also get rid of the Colorado health insurance exchange on Tuesday brought a concerned crowd to the state Capitol, where people rallied with state Democratic leaders. Coloradan Amanda Miller shared a story of a car crash she and her husband Matt Miller were in that resulted in Matt needing extensive emergency care for a head cut. Amanda said without coverage under the ACA they could not have paid the medical bills that accumulated while her husband was in the hospital. “No one should be left on the side of the road bleeding and wonder: How am I going to pay for this?” Amanda said. House Democrats organized the rally. They also talked about state Senate Bill 3, which would repeal the state’s exchange, and is scheduled to be heard Tuesday in the Senate Finance Committee. Senate Minority Leader Lucía Guzmán, D-Denver, said the hearing was delayed because of the crowd outside. Sen. Jim Smallwood, R-Parker, told the media later that it wasn’t delayed to next week because of the rally, but so he could hear a presentation Thursday from Connect for Health Colorado’s board of directors. Smallwood said he is concerned that his bill is getting labeled as an attack on health care instead of an attack on a system that is not delivering what it promised at the expense of taxpayers. “I think what you heard today was the obvious fear of Washington making bad decisions, and I think that is completely justified. But I don’t want that to get confused with Senate Bill 3. which is simply changing the purchasing platform,” he said. The idea of moving Coloradans to the national platform for purchasing health insurance could be moot if the ACA is repealed, however, and Smallwood cannot guarantee that such a move would result in more providers and plans to choose from or that premiums will go down. “Anyone that knows anything about health care is not going to guarantee that just making this change alone is going to lower people’s premiums, there’s a lot of levers that need to be pulled for that to happen,” he said. Smallwood said he has reached out to Democrats to garner support for SB 3, but he is uncertain if it will make it through the House, where they hold a 37-28 seat advantage. “At the end of the day I can’t control if people are married to an ideology and they’re not willing to look at the data and the facts behind it,” he said. Guzmán said she agreed that there is an ideological divide between the two caucuses, with Democrats believing that health care coverage should be a right and not a privilege. “Rights come with a cost also. Democrats are not saying we believe everyone should free-load the system,” she said.